Tubular External Fixator customized as per the specifications of our clients. These tubular external fixators are made from sterilized SS and have definitely reduced risk of infection. These tubular external fixator are designed and developed as per various medical standards. The external fixator is one of the mainstays of operative fracture treatment. It allows “local damage control” for fractures with severe soft-tissue injuries and can be used for definitive treatment of many fractures as it provides relative stability, which results in healing by callus formation. External fixation is an essential part of damage control surgery in polytrauma as it permits rapid stabilization of fractures with minimal additional (surgical) injury. Deformity correction and bone transport are also possible with external fixation. 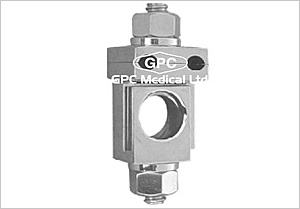 GPC Medical is a government of india recognized star export house company. We are exporter and manufacturer of tubular external fixator from India. This entry was posted in External Fixation Device, Orthopaedic Implants, Uncategorized and tagged Ankle External Fixator, Circular Clamp 8mm Rod, Compression Device, Connecting Clamp, Distal Radius External Fixator, Double Adjustable clamp, Elbow External Fixator, External Fixator, External Fixator Device, External Fixator System, Femur External Fixator, Leg External Fixator, Orthopaedic Implants & Instruments, Orthopedic Open Clamps, Schanz Pin Introducers, Schanz Screws, Single Adjustable Clamp, Small Bone Clamps, Small Connecting Bars, Spanners, Transverse Clamps, Triple Trocar Set with Handle, Trocar Set With Handle, Tube Clamps, Tubular Fixator Femur Manufacturer, Tubular Fixator Forearm Manufacturer, Tubular Fixator Forearm Metacarpal Tubular Fixator Femur & Tibia, Tubular Fixator Manufacturer, Tubular Fixator Metacarpal Manufacturer, Tubular Fixator Tibia Manufacturer, Tubular Rods, Universal Joint for 2 Tube, Wrist External Fixator. Bookmark the permalink.